You are currently browsing the archive for the Hoof Boots category. Have you been thinking about hoof boots, but aren’t sure how to measure your horse’s feet so you can choose the correct style and size? 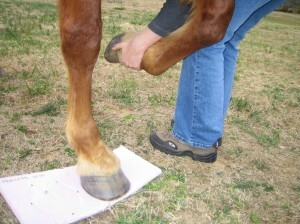 Try using foam board to make hoof imprints, then measure the imprints instead of the hoofs themselves.